What’s on in Brisbane on the school holidays? Start with the Brisbane Kids Calendar. This is the most comprehensive events calendar for families located in Brisbane, or for those families visiting Brisbane. We also include major events from the Sunshine and Gold Coast. Our calendar is updated daily and will give you all the best ideas on events happening over the school holidays. All the shopping centres list their events on our website along with the Museums, Art Galleries and other child-friendly venues. During school terms our calendar is also flooded with school fairs and local festivals. Take a drive to one of the many places in South East Queensland- read our ultimate Day Trip ideas list. Our Explore Brisbane section is filled with ideas a little closer to home from bushwalking, mountain climbs and creeks to discover. There are so many things to do at South Bank with regular nightly markets and other special events throughout the year. We list all the events on our calendar and you can check on the markets via the visit South Bank parkland website. Kids love South Bank for 17 acres of parkland with lots of green space for family picnics, BBQ’s and games on the lawns. Play on the two incredible playgrounds (Picnic Island and Riverside Green). Both have picnic areas nearby. Admire the rainforest garden which is amazingly lush for an inner-city space. Sail along the river on a citycat or take a cruise with Star City Cruises or the famous Kookaburra Queen. Often South Bank have a trackless train cruising around the parklands you can ride in or grab a green taxi to go from one end to the other. Enjoy a hokey pokey icecream at the New Zealand Icecream shop or across the road from South Bank you can indulge in Max Brenner chocolate treats or head over to Nitrogenie for icecream created with liquid Nitrogen. At the base of Mount Cooth-tha sit the immaculate Botanical Gardens. Most of the gardens can be accessed by flat pathways, making them accessible for prams and wheelchairs and there is a cafe on site though many families opt to bring a picnic lunch and enjoy some time amongst nature while they eat. The Sir Thomas Planetarium which sits next to the gardens is a great place to bridge some conversation around science or space. Check our website to find out about when the astronomical viewing nights are and when the International Space Station is headed over Brisbane. These are a great way to extend the learning and enjoyment of a place like the Planetarium. You can see a show while you are there (book in advance online on school holidays) or just walk around the planetarium and check out space suits and other space-related paraphernalia and information. Head to the information desk at the Gardens and ask for a Hide and Seek Trail guide and you and your kids can enjoy a sensory trail experience of identifying sweet smelling herbs and plants. The natural playground a new feature and will afford a lot of imaginative play from kids who might be more used to the plastic structured playgrounds. Head into the dome and marvel at the humidity and the fish in the pool at the top. Catch a show on space in the Sir Thomas Planetarium. These are designed often with kids in mind and are both entertaining and quite marvellous in the way they display them. The Queensland Museum at South Bank changes as your kids do, we always suggest going when you feel up to answering and asking lots of questions because this is the best way to make the most of your visit. For younger kids the playasaurus garden at the bottom of the Museum is a favourite with regular holiday screen shows, tunnels, dinosaurs and a range of interactive offerings. The Dinosaur section on the next floor up, (located next to the cafe), is a favourite with dinosaur loving kids especially when you put into perspective the size and age of the fossils. The next floor up is the Discovery Centre which is a place for the people. What this means is it was designed to not only showcase the findings of the Museum but also allow the people/community to come in and check them out. When you arrive talk to the staff and find out what’s happening. There are often fun activities or things happening, you might even get to hold a stick insect! 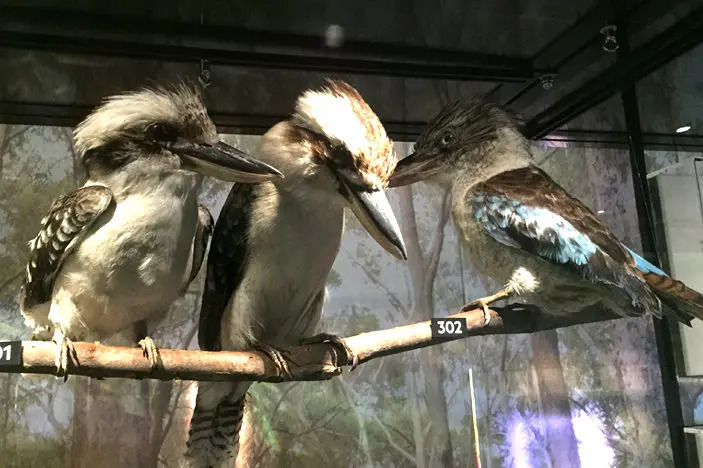 Another permanent exhibition at the Museum is the Wild State Gallery which is a showcase of the biodiversity in Queensland. Filled with animals and a tunnelled area to explore, this is a favourite amongst kids. Located in City Hall, the Museum of Brisbane is part of the living history of the city, examining how Brisbane and its the community change over time. They often have school holiday activities and you can also take a free tour of the clock tower! With a children’s art space and regular free kids exhibitions, check out website calendar for what’s on this school holidays. The children’s gallery is free to enter and will often have free craft activities. GOMA is surrounded by green space and views of the Brisbane river making it a great place to grab a picnic. Wedged between GOMA and The Queensland Musem is the State Library which once again has a dedicated children’s space called The Corner. With regular free family entertainment and workshops and games that the kids can play, this is a great time out from the bustle of the city. They also host regular (but very popular) paid workshops and are worth looking into in the lead up to each school holidays. A little further than Brisbane but none the less worth the drive, check out the train-themed Workshops Rail Museum. Their exhibitions vary so check our website first and while you are down that way, make sure you check our website for some of the Incredible Ipswich playgrounds, find out what the Ipswich Art Gallery has on for kids and visit the free nature centre in at Queens Park. Nestled within the leafy confines of the Daisy Hill Conservation Park, this small but interesting enclosure is a great way to educate your little ones about the threat to one of our countries cutest animals whilst also getting up close and personal with our furry friends. There are resident koalas and pram friendly bushwalks you can enjoy that head off from the main centre. All these activities are on our website- just use the website search function to locate them. Enjoy some mini golf at Victoria Park at Herston or Golf Central at Skygate which is close to the DFO near the airport. Go roller skating or iceskating at places like Iceworld or Albany Creek Skateaway. If your kids are more the skateboarding or scootering types then check out Ramp Attack or a local skate park or for BMX riding any one of the awesome Brisbane BMX tracks. While you are up at Bribie, enjoy some of their beaches and then explore the Abbey Museum on your way home. Head to Bribie, Redcliffe, Wynnum or the Gold Coast for a twilight fish ‘n’ chips on the beach or a picnic. Take a train ride or check out our guide to Trains, Trains, Trains for more themed locations – kids love to ride on trains! Check out any of the playcentres in Brisbane for some indoor, air-conditioned fun – this list includes the best trampoline parks. Visit one of the 140+ WOW playgrounds on our website. Have you seen the new Harry Potter Shop at Samford yet? its incredible with butterbeer and the kids can get sorted into their houses! Go strawberry picking at one of the many strawberry farms around Brisbane (check the seasons). Visit Maleny Dairies for a real life dairy tour or check out all our farm stays (just use the search on the website). Check out Robelle Domain in Springfield – with lots of water fun and a cafe for parents in the middle. Go to Lone Pine Sanctuary for a day amongst the animals, (make sure you check out their annual passes if you plan to visit again). 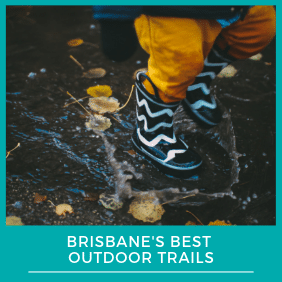 Find a local river or creek with kids and have them build a dam, catch guppies in a bucket and enjoy Brisbane. Visit the Maritime Museum at South Bank. Head to the Queensland Zoo – to see the animals, the Big Pineapple and to have a picnic. Read our review first, they have some extremely unusual animals and animal encounter opportunities. Go to Mount Glorious for a picnic, child friendly bushwalk and scones with Jam and Cream on the way down. Head out to the Abbey Museum in Caboolture for some history and wonder. Take a trip to Springbrook for a glowworm tour. Go to the beach- collect shells and build sandcastles for FREE. Take some gloves and a bucket and collect a bucket of trash while you are there. I know it doesn’t seem fun, but it will teach the kids an understanding of how we continue to be blessed with some of the best beaches in the world and the importance of leaving only footprints. Geocaching is a multiage activity and if you can muster up some trinkets, it is also completely FREE. Just search for geocaching on our website for the ultimate guide on how to geocache in Brisbane with kids. Check out the Caloundra lighthouse for a bit of Sunshine Coast history and nautical education (just search on our website). Have an astronaut read a book from space to your kids, preferably after a visit to the planetarium, Kingaroy observatory or one of the many astronomy viewing nights at Mt Coot-tha (just search for these on our website). Visit Miegunyah House Museum for a visit back in time to Victorian history. Have an icecream for lunch- head to anyone of the best icecream shops in Brisbane, as nominated by you! Check out your local Bunnings for FREE holidays activities for kids and the Bunnings Playgrounds. Go for a drive up to Mount Tamborine- take in the views- pack a picnic – enjoy the fresh air and if you fancy take the tree top walk or book the kids into some thunder egg seeking at Thunderbird Park. Head to one of the many zoos in and around Brisbane> Brisbane Kids offer great deals and discount here. Take the kids to the local farmer markets or second hand markets. Head to one of the two butterfly houses in South East Queensland. Find them on our website under “butterfly”. Head to the Crystal Castle just outside Byron, it has the biggest Amethyst Cave in the world and plenty of amazing crystal structures to inspire and bring peace to a busy world. Go camping… and for us chickens.. camp in your backyard! We have reviewed lots of different camping spots on the website- go check them out! Take a visit to Old Beenleigh Town on the southside (or Old Petrie Town on the northside) over 20 restored buildings.. good for little historians – small cost. Take your Brisbane Kid indoor rockclimbing or outdoor rockclimbing, or for the less adventurous at heart read our review on climbing Mount Coolum which is a popular climb for families. Head to the Glass House Mountains Lookout for a picnic and pick up fresh fruit and vegetables on the way home. The Landsborough playground reviewed on our website is amazing! 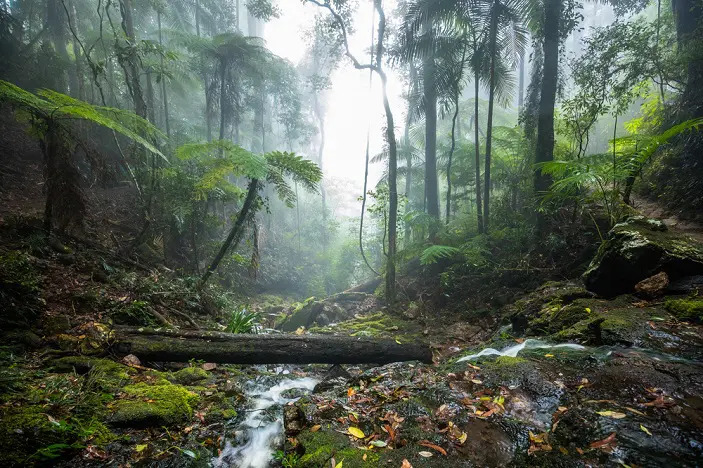 Head to the Springbrook Lookout for an amazing rainforest walk. While you are at Springbrook, have a picnic at Apple Tree Park, also reviewed on the website. Visit Moreton Island and if you are able, book into feed the wild dolphins at Tangalooma. Check out Queen Mary Falls on an awesome road trip with the family (reviewed on our website). Go to the movies and check out the the new movies that are released for kids every school holidays. Take a day trip to the Darling Downs Zoo. Head out to the Wivenhoe Dam on a day trip. 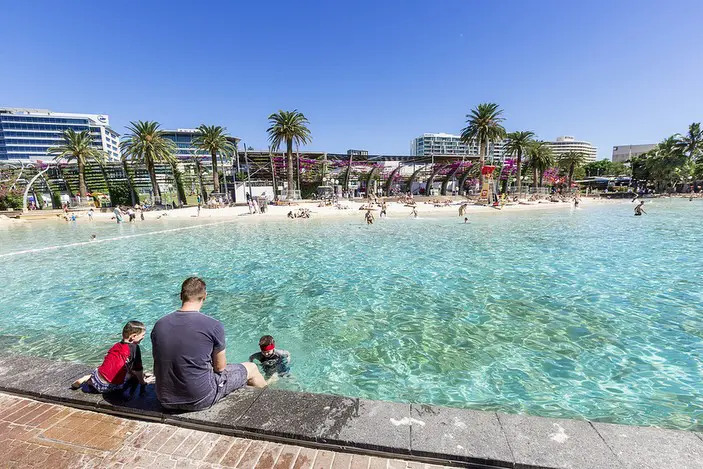 Check out one of Brisbane’s FREE water parks or Swimming Pools. Check out the Eumundi Markets on a Wednesday or Saturday or another awesome attraction of the Sunshine Coast. Check our Slaughter Falls for a bbq and then make the walk up to the summit at Mount Coot-tha- you will find a guide to this walk on the Brisbane Kids website. Walk through the Boondall Wetlands and see what holiday activities are on at the Environmental Centre. Go to a Theme Park with discounted tickets thanks to our discount theme park tickets page. Head out on a nighttime adventure with our guide. Visit the Kombutcha Environmental Centre at Eatons Hill for a play on their fenced playground and a walk through their lush grounds. They also have a native plants nursery onsite. Complete a Laser Tag mission, ride the bumper cars and play the arcade games at Laserzone in Lawnton. Find out what free holiday activities are on at IKEA. Discover how to Paintball in Brisbane. Visit Osprey House for a dip into the importance of the protecting the environment and enjoy a picnic in the natural area that surrounds. Bowling is a surprising hit for most kids from the age of about 6. Head to the website of the bowling alley first because most offer family-friendly holiday deals. Head to Gardiners falls (otherwise known as Serenity falls) for a lovely cool walk while being serenaded by whipbirds. Ask your Brisbane Kid what they want to do. Enjoy them.. because this won’t last forever! My kids will be kept busy on the school holidays for sure. Thankyou for the ideas. i have found this imformation very useful! Abbey museum at Bribie has school holidays activities program. Took my kids there yesterday and it was well worth it. Inexpensive and plenty to do. For $ the kids had a 45min archery lesson. We painted our own shields and princess hats dress up in medical garb nd did plenty of arts and crafts as well as outside play. Be prepared to read instructions and make your own fun.